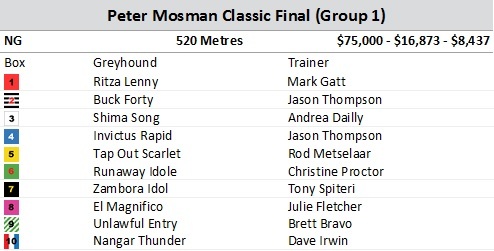 Ritza Lenny has finally drawn ideally in a group race final, drawing box one for next Saturday's (June 25) Peter Mosman Classic at Wentworth Park. Jumping from box two in the second semi-final on Saturday's program, Ritza Lenny was able to get in to a suitable early position before finishing strongly over Runaway Idole, clocking 29.82. A pleased Mark Gatt said it was nice to finally draw well. "He drew out wide in the Richmond Riches final couple weeks ago and couldn't get in to the race, box one gives him every chance now," Gatt said. Ritza Lenny will start on the inside of Jason Thompson's Buck Forty, who finished second to Shima Song in the first semi-final. One of two runners for Thompson, Buck Forty looks the stronger of the camps chances, with Invictus Rapid drawing box four. The Bruce and Julie Fletcher prepared El Magnifico was brilliant for the second straight week, recording best of the night figures of 29.72. Leading throughout, El Magnifico has drawn box eight in next week's Group 1, $75,000 to the winner final, which Fletcher says is better than a middle draw. "Ultimately, we did get to choose as the last ones out, but the eight was better than a middle draw for him, given the inside boxes were taken early," Julie Fletcher said. Zambora Idol for Tony Spiteri was the other semi-final winner, taking qualifier three in 30.16 over Tap Out Scarlet. In addition to the four Peter Mosman Semi-Finals, Wentworth Park played host to the GBOTA Challenge finals, which had seen runners qualify through a point score system, which commenced back in May. The stayers opened proceedings and it was Iona Muffin Top for Marty Green and Frank Sidrak which upset his more fancied rivals, scoring in 42.78 over Hooter Harnett and Nureyev. Frank Sidrak said that he'd been looking to get the dog right for the final worth $20,000. "We started him at Bulli in May, and at that point he was a fair way off being right to genuinely stay, but I knew I could build him up to this final," Sidrak said. With $35 on offer, those who were willing to follow Sidrak's word benefitted, beating the likes of Knocka's Return and Lachy Balboa who featured in the 2015 series. In the sprint series, Sutton Forest based Michael Clayton had qualified four for the final, so it was no surprise a Clayton prepared runner took home the $20,000. Slick Simzy from box three was quickly away and as a result never headed, clocking 30.42 over It's A Movin' and Awesome Danny.